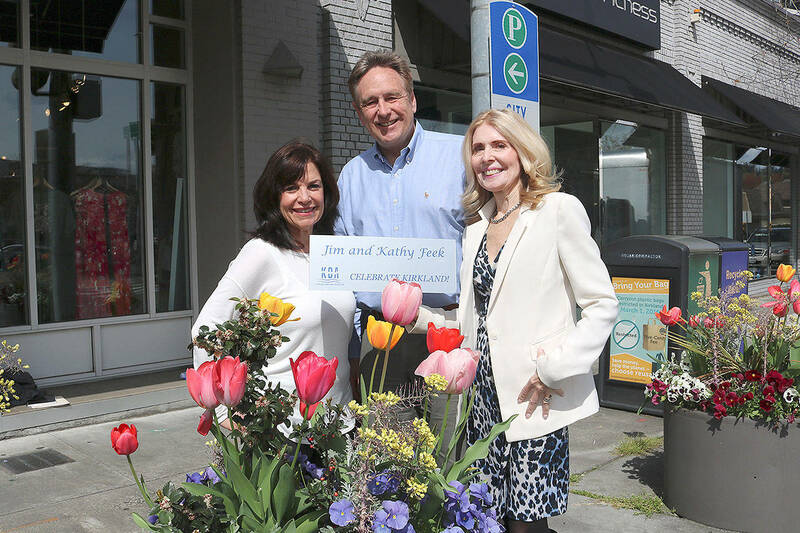 During the Celebration of Youth luncheon fundraiser for Kirkland-based Friends of Youth (FOY) on March 15, a common theme running through the various speeches was the idea of being there for all young people. From a formerly homeless young woman who has received help in dealing with issues that arose from a troubled childhood, to a second-grader working with an in-school FOY therapist to process the trauma he experienced when he was really young, speakers shared their personal success stories or high points of the young people in their lives who have benefited from FOY’s services. Dr. Anthony Smith, superintendent of the Riverview School District in Carnation and Duvall, shared a bit about his upbringing. He discussed the difficulties he and his brothers faced as his stepfather committed suicide and his mother turned to alcohol. Despite these hard times, Smith also touched upon the positive influences in his life such as a band teacher who helped him aspire to excellence. Smith said while the challenges he faced growing up pale in comparison to some of the challenges young people face today, he understands the importance of having caring adults in young people’s lives. He added that he has seen what that has looked like as FOY provides counseling services in his school district. Joanna Martin, whose 7-year-old son Adam goes to school in the Issaquah School District, has also seen how FOY’s counseling services have helped firsthand. During her emotional speech, she shared how she used to receive daily reports from the school about Adam, who she adopted out of foster care, acting out and threatening other students. And now that he has been working with an FOY counselor at school, he has made progress in dealing with his issues, Martin said. She added that the fact that the services are at Adam’s school and would not interrupt their schedules and are provided at no charge really helped as she is a single mother with a full-time job working to provide for her son. “It really was the answer to my prayers,” Martin said. Other services provided by FOY — which serves 18 cities throughout east King and south Snohomish counties, including Redmond and other Eastside communities — range from foster care and street outreach and drop-in services for homeless youth, to mental health counseling, substance abuse treatment, parenting education and support and more. While they cannot guarantee that young people will never be in crisis again, Jim Theofelis said they can make sure that there are resources available to support those young people. Theofelis is the executive director of A Way Home Washington, an organization whose goal is to preventing and ending youth homelessness in Washington. He discussed the importance of having a statewide network of organizations and agencies to ensure young people all over Washington can feel safe. Theofelis also discussed the concept of “yes to yes,” meaning when a young person says “yes” to asking for help, organizations and agencies should be able to say “yes” to providing that help. Washington state’s First Lady Trudy Inslee also spoke at the event, which was held at the Hyatt Regency Bellevue. Inslee praised FOY for the organization’s work as it is a truly great cause in making sure every young person they serve feels safe and succeeds. FOY president and CEO Terry Pottmeyer thanked Inslee for her work in helping homeless youth. “The minute I met her, I knew she was the real deal,” Pottmeyer said about the first lady, comparing her to the “Fearless Girl” statue that is now facing down the famous Wall Street bull in New York. Pottmeyer described Inslee as an outreach worker extraordinaire, presenting her with a green FOY jacket that is worn by the organization’s street outreach staff. And while adults may be the ones providing the help, a couple of the speakers also noted that their time with the young people of FOY has also affected them. Tylor Harris of the Seattle Seahawks shared a story about visiting FOY’s Griffin Home and meeting a boy who he spoke to for only 10-20 minutes. The defensive end said through their conversation, he learned that the boy liked to rap and the two exchanged a couple verses. “That really touched me,” Harris said about the experience. Renee Sajous, who has been a foster parent with FOY for 14 years, said the kids she has taken care of over the years have taught her a lot as well — from perseverance and resilience, to what “real” macaroni and cheese is (“Only macaroni and cheese from the box is real macaroni and cheese,” she has been told).